Bag maker Booq has responded to the increased use of compact mirrorless cameras with a bag suited to them. The bag is as compact as the camera systems but we were easily able to store both the GX7 and four lenses including the 150mm zoom. 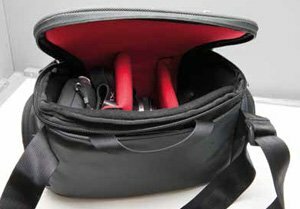 The bag is top opening so that it acts as a 'bench' when changing lenses and has two side pockets for cards, spare batteries, car keys, etc. It also has a rear flap pocket sized to suit an iPad Mini. Finally there is a top slot, with zip, for a mobile phone. The bag is well made, as we have come to expect from Booq, in a stylish dark-grey Cordura trimmed with red innards. It is also equipped with a metal Terralinq tag in case of loss, so that it might hopefully be returned! We took it for a long walk on a wet and windy day at the seaside and it carried very well, indeed you were barely aware of it around your neck!